Multimedia instruction is an important resource for members of the educational community when learning how to use the tools required to perform their job. This paper looks at how to effectively communicate to educators how to use the necessary technology and the importance of using multimedia instruction. Aeries is the program used by many K-12 educators as it is used in much of California to track student attendance, progress, discipline, and many other aspects of K-12 learning. Online communities of educators can help to perpetuate the knowledge of the program and help others gain the same level of knowledge of their more knowledgeable peers. Using an online course to make sure every instructor has access to the same resources will be looked at to determine if it can ensure that the necessary level of knowledge is being achieved. The purpose of this tutorial was to develop a tutorial which can be used by K-12 school districts in California to instruct teachers how to use Aeries and continue to develop their skills in Aeries throughout their employment as a teacher. The tutorial covered several aspects of the general use of Aeries and how it can improve both organization and ability to teach more effectively and thoroughly. The key areas the tutorial covered are attendance which was the most important part of the Aeries training and necessary for the learner to use every day on the job. Other areas which the tutorial covered are grades, student information, and resources which allow the learner to further enhance their job using the technology Aeries provides. The purpose of this research was to analyze the necessity of multimedia instruction in delivering the information in a concise and memorable method which can be referred back to any time during the span of using the Aeries software. Online community building will also be looked at and how this can be applied to the Aeries tutorial to allow teachers to share information that has been helpful throughout their time using the software. Aeries is an extremely important software package for teachers to learn in California, this paper will research the importance of teaching Aeries to existing and new teachers. How to best teach an adult group of educators who need to utilize this technology daily giving them the knowledge and a place to refer back to in order to keep the knowledge available at all times. How Multimedia Instruction benefits the learners ability to retain learned information and increase the motivation during the learning process. How online collaboration environments can lead to a positive leadership learning experience for the real world and how that transfer helps the learner in many aspects of online learning. In what way does enabling a community of learners to communicate within an instructional tutorial enhance the retention and expansion of knowledge? How to ensure everyone is included in the discussion and learning to propagate the message to all learners equally. Aeries is required knowledge for teachers in over 500 school districts or educational agencies spread throughout California making it the most used and most important Student Information System (SIS) (Eagle Software, 2010). Stream lining the process of teaching the teachers who are required to interact with Aeries on a day-to-day basis will allow them to perform their job more efficiently and allow them to reach a level of comfort with technology they would not normally achieve. Knowing all the features of Aeries and having a resource to go back to at any time will help the teachers not only be more comfortable with the program but also allow them to build upon the knowledge which they’ve already obtained and cement that knowledge by helping others who are not as familiar with the software. Knowledge to perform the basic tasks using the Aeries software is not always delivered in an effective way which makes the topic of this research extremely important to the education system of California. Currently only a fraction of Aeries’ features are used by teaching staff at many schools and the power of the software is utilized in limited quantities. This project helped enlighten the teaching staff of Chico Unified School District and spread the knowledge and benefits of the Aeries SIS to K-12 school teachers, staff, and students. Methods of teaching new staff members about Aeries are limited in Chico Unified School District. Along with the teaching being extremely inefficient and labor intensive, there is no easy place to go for teachers who may have questions after their training and there is no easy place to go for help and ask questions or learn about features others have found. This project looked at how to better achieve a lasting solution that can expand with the knowledge and features of Aeries, it also looked at how a community of teachers can help to spread knowledge that may otherwise be lost to a few staff members. There is a great importance of SISs in influencing the education of students and the importance of parental involvement in students’ lives (Ngoma, 2010). Multimedia instruction. Multimedia Instruction uses multiple forms of modal input in order to achieve a better understanding of the instructional material. It can use the learners ability to process both visual and verbal systems of memory (Seo, Templeton and Pellegrino, 2008). Aeries. Aeries is a student information system which utilizes many technologies in order to meet the needs of schools, districts, and education agencies to track students attendance, accomplishments and various other aspects of their attendance in the school system (Eagle Software). Student Information System (SIS). A computerized system using a database for the backend and a software or web interface for the front-end, this project only recognizes using a web interface for the front-end. Online learning community. A group of people online interested in the same topic who use an online communication method to communicate their interests or knowledge on the subject. This will take the form of comments on each lesson in the tutorial and a forum for asynchronous communication between staff members. Aeries student information system is used by all K-12 teachers and administrators sometime during their career. Students benefit at least indirectly from the use of an online based student information system such as Aeries. Computers are provided to every teacher in their classroom to access the necessary portions of Aeries they must use along with the training documents which will be presented to them. Staff members will have basic knowledge of the Internet and how to browse a web site. This includes the knowledge of basic web site layout and workflow and the basic ability to understand certain cues on a web site such as breadcrumbs. Not all teachers are administrators will have an interest in building upon their knowledge of the Aeries system using the community sharing portion. The intended audience of this tutorial and community web site is staff members of Chico Unified School District. This project consists of five chapters; in addition to these five chapters there is an appendix, all included references, copies of the evaluation forms and surveys, completed surveys and evaluation forms, compact disc (CD) instructional tutorial product screen shots, and Institutional Review Board (IRB) documentation. Chapter One includes the statement of purpose, rationale for this project, definition of terms, and the assumptions and limitations of this project. Chapter Two consists of the review of related literature laying out the need for a multimedia instructional tutorial to teach Aeries. Chapter Three develops the overall project and methodology. Chapter Four describes what the instructional product will consist of including the look and feel of the project. Chapter Five will lay out the findings, conclusions, and recommendations of the final product after the product is completed. The importance of this tutorial will be fully explored and defined along with the importance of using multimedia instruction to accommodate the wide range of learning styles and needs of an educational establishment. It will also show the importance of a community in building the necessary knowledge to fully take advantage of a software package as complex as Aeries. Effectively communicating an idea or information is a difficult task which has had substantial research and thinking invested into its proper delivery. Online communication is another level which requires not only the traditional aspects of effective communication in order to deliver a message properly but must be achieved without the seemingly necessary aspect of human contact. Online communication has provided a great deal of support and information for people across the globe therefor the importance of learning how to communicate properly using online communication as a teaching medium is extremely important. Becoming a leader in the online communication environment can be a great asset. Self-organization, coordination, and sociability are three things necessary for communication online. (Barnett & Coulson, 2010). As there are many different ways to communicate online, there is no single correct way of doing this but depending on the choices made for communicating there are some methods which are better than others. Looking at various ways of communicating effectively online and creating a sense of community rather than division is looked at closely in this review with methods of furthering the ability to communicate online and lead in an effective way. De Leng, Dolmans, Donkers, Muijtjens and van der Vleuten (2010) state that “when students engage in face-to-face or online discussions, they interact with their environment (communicative events) and express their thoughts and knowledge (communication of cognition)” (pg. 644), both online and face-to-face require these interactions. Online video games naturally have a leader and follower relationship built into them which has made them a great subject to look at when determining if real life leadership skills can be acquired through the use of playing social online video games. Video games are sometimes thought of as a reclusive activity where the user does not learn any social skills and is cut off from the rest of society, maybe even thought of as having difficulties participating in a face-to-face situation. On the contrary just as there are large communities in real life to share interests or meet new people to further connections, socialization, and interests these same types of groups formed in video games, or more specifically MMOs (massive multiplayer online) (Barnett & Coulson, 2010). According to Barnett and Coulson (2010) "people will form large real-world communities to share common interests, the same kinds of groups are formed in MMOs" (pg. 173). This type of community is not limited to real-world or MMOs though; it can be used to enhance the knowledge of a group with similar interests such as teachers using a student information system. McLean (2007) states that “a community is a group of people who are bonded over the love of something or who share similar experiences” (pg. 23). This statement explains how a group of people who share similar experiences can then enhance the knowledge of the whole group by sharing that experience with others in the community. Since the beginning of online instruction there has been a great deal of research on the effectiveness of collaborative learning online and linking this to face-to-face learning. Studies about self-directed learning and the importance of it in online instruction have been analyzed extensively and studies have also been conducted on the social process of learning online and the professional world (McLoughlin & Luca, 2002). McLoughlin and Luca state that "the creation of a constructivist, learner-centered environment where curriculum outcomes and tasks are aligned can foster cognitive skills and a deep approach to learning" (pg. 574). If self-directed learning is the most vital element to online learning, there may not be room for many in the leadership role according to the direction of some research. This need for leadership is true face-to-face also and it seems research has gone in the direction of leadership skills online and face-to-face are closely related and may be interchangeable. Just like in online discussion groups where there are lurker and posting types of people this concept easily translates into online video game worlds. Posters are more active in both scenarios as they are generally more likely to lead a discussion or in the case of a video game lead a specific task. Mo and Coulson (2010) has done research regarding online support groups stating that "two types of user engagement within online support groups have been identified...those who actively post messages (‘posters’)" which are posted by a small amount of people, in other words they are more likely to be the leaders and then there are 'lurkers' who "read messages but do not themselves post messages to the group" (pg. 1184). These concepts which Mo and Coulson present create the idea of leaders guiding the process of learning and inclusion of all learners. Leaders try to accommodate a groups discussion while including all members, they also have the important task of asking questions which may guide the direction of conversation in a much more productive direction. In an online video game these same actions are necessary to lead a group into success at whatever task is attempted. There is a recurring theme in studies indicating that students develop much differently in an online setting rather than in the classroom. In many cases learning online can ease a person into being more comfortable and more open in a face-to-face situation. Students in the study in an article written by Pickering (2009) displayed varying degrees of improvement or merely falling behind the veil of the status quo. By understanding the importance of understanding how similarities between human social development in everyday life and the development of those social abilities online it can lead to a greater understanding of how greater leadership skills can be obtained through the online community and online challenges that social video games present (Miller & Cryss, Brunner, 2008). Different outcomes were reached by each student but through observation it can be seen of the important roles online communication can have on leadership skills and how that may translate into the business world (Miller & Cryss, Brunner, 2008). Along with leaders benefiting from online video games others do also, especially in their confidence and comfort levels which can indirectly make it easier for the leaders (Miller & Cryss, Brunner, 2008). This occurs because they now have a much easier group to manage therefore their personal skills have increased and their job has become slightly easier when dealing with others (Miller & Cryss, Brunner, 2008). Misunderstandings pose a challenge in the online environment as they can interfere with the ability to understand the complete message and they can even discredit a leader if the information is misinterpreted severely enough. McKee (2002) studies a great deal about some of these misunderstanding and if they truly have as great an effect on the final message as it may first seem evident. The outspoken few both in online forums (this article focuses on these) and online video games generally become the leader of a discussion or a task in a video game. Along with this leadership role comes dealing with members being led who are not happy with the way things are going or feel the need to speak out without presenting any sort of solution (McKee, 2002). McKee makes a strong case for these types of outbursts being not nearly as negative as previously thought and can even lead to a better discussion which is more inclusive of the group as a whole rather than just a part. Leading online is now a vital part of leadership in a corporate environment with the introduction of many technologies making it possible and more popular (Kolb, Prussia & Francoeur, 2009). The importance of learning to communicate properly online is highly prevalent in today's society with teleconferencing, video presentations from a remote location and many other technologies which allow for a leader to facilitate a meeting with a group from a remote location (Kolb, Prussia & Francoeur, 2009). Possession of these valuable online communication skills can come a great deal from online video games which require group dynamics such as many MMORPGs (massively multiplayer online role playing games). Kolb, Prussia and` Francoeur (2009) discuss how these online leaders can translate their skills in leadership directly to a face-to-face environment and therefore become much more versatile in the job market. How to accomplish instructional information delivery has changed for all aspects of the education and business world (Tsang & Zhou, 2005). Even the way in which leaders gain their skills has evolved and the leaders ability to discover these importances is another way for them to stay on top of the information curve (Tsang & Zhou, 2005). The change from leaders needing to perform activities only within a face-to-face setting has changed drastically to a more online centered view of performing these same activities (Tsang & Zhou, 2005). While the requirements have changed, traditional leadership roles have not necessarily changed the way in which leaders gain their abilities and knowledge. Currently the work place is very lenient on a leaders ability to understand and utilize these online methods of communication, but as these technologies become more necessary, methods of teaching a better way of learning them will be required. Online video games which require a great deal of communicating with other players and require a leader to take charge may be the best method to accomplish this as it has a high motivational factor and may prove to be even more effective than traditional forms of online communication (Tsang & Zhou, 2005). Livingston and Condie (2006) researched online social video games may impact leaders in learning to properly adjust to an online world, Livingston and Condie state that "e-learning is not the same as traditional classroom learning" (pg. 154) and must be looked at not only from the aspect of the learner but the people who may take charge and lead a discussion or an entire unit both in an educational setting and a business setting. When discussing interactive multimedia it is important to look at how it can be an effective means of organizing information for the learner. Herron (2006) studied two aspects of using interactive multimedia, one aspect is the effect of using an interactive multimedia authoring tool on staff members who must utilize the technology properly. Another aspect of the study is how students interact with the learning objects differently than a standard multimedia project or a project that does not include any type of multimedia. Herron states that "both undergraduate and graduates found the interactive multimedia tutorials useful and that both groups could improve their information literacy by using tutorials" (p. 65). Cronin and Myers (1997) researched the importance of interactive multimedia instruction including where the line might be for the importance of including video into the lesson or if text or audio might suffice. Cronin and Myers state "theorists have explained the effectiveness of visuals in learning as a function of the increased comprehensibility of the content, selective increases in learners' attention, and increased enjoyment" (pg. 47). How to apply this effectively is a question that can be answered and therefor applied in a proper method that allows for maximum absorption. Creating the knowledge necessary to perpetuate the use of multimedia instruction is a challenge not easily overcome with some generations unwilling or unable to progress in their knowledge of the technology necessary. Seo, Templeton and Pellegrino (2008) looked at how using multimedia technology can have a great impact on teachers in their learning stages. It is useful to instruct teachers not only in how to use these technologies but also how to best implement to benefit those they teach. By using multimedia instruction to teach educators how to best utilize the technology they will also gain confidence in using it therefore transferring that confidence into those being educated. Using multimedia instruction to instruct the teachers how to perform activities which they must perform daily can also help reinforce the necessity of technology in their lives and how their knowledge and use also effects that of the students. Seo et al. looked at how "the experience of producing the multimedia projects influenced the preservice teachers' knowledge and confidence in using technology" (p. 262). Having confidence and knowledge in the technology used and taught by teachers can help deliver a higher quality learning experience to the students. Expanding the reach of technology and using it every day in a classroom has its benefits but cannot be fully realized until staff members in those classrooms are knowledgeable enough about the technology. Bell (2010) states the importance of staff knowing the technology needing to be used in the classroom but also knows that there is a large discrepancy in technologies implemented and knowledge of that technology. Making sure all staff members are thoroughly trained in the technology used in schools is important to be able to get the full benefit of technology. Bell realizes the importance of knowing what teachers know what information and whether anybody realizes if they don't know the technology. Depending on the method of delivery for multimedia instruction, varying degrees of absorption of information can take place. Pastore (2010) shows the importance of finding the correct pace and how diagrams can affect the quality of the multimedia presented. According to Pastore's studies, "presenting verbal representations as audio rather than text in a multimedia environment better supports learning" (p. 489). When instructing teachers using multimedia instruction it is important to combine various formats of media in order to both enhance the learning experience and also reinforce the importance of this form of teaching in today's multimedia heavy culture. Part of creating the proper multimedia instruction is to provide audio in the proper time sequence which allows for fuller absorption of the material. Tabbers and Koeijer (2009) discovered that users with learner controls take a significantly longer time on the lesson than those without but use that extra time to go over slides and listen to audio at will to gain a better understanding of the material. With so many perceived limitations of learning and the human brain, cognitive load theory (Sweller & Chandler, 1994) is a common explanation of these real limitations. Thompson and McGill (2008) state that according to the cognitive load theory “the human cognitive system possess a finite processing capacity, which is split into channels for various modalities, and learning will be inhibited if any of the cognitive channels is overloaded” (pg. 144). Thompson and McGill found that “a positive effect on learning can be expected if narration is used as opposed to on-screen text” (pg. 155) and that while this finding may be used in isolation it does not provide the same benefits if the learner does not have the necessary resources such as sound capabilities. By combining various modes of output to the learner, multimedia instruction has the ability to enhance instruction beyond what was previously possible. A Microsoft Power Point presentation, while allowing for multiple modes of output, limits those outputs as opposed to interactive multimedia in use in many multimedia instructional applications. Tempelman-Kluit states “a goal of CLT instruction is to maximize meaningful learning potential. Meaningful learning occurs when connections are made between information in the visual- and the verbal-processing channels of working memory” (pg. 365). These connections create a more meaningful learning experience benefiting all parties of instruction. Another level of multimedia instruction would be to include some interactivity which makes the learner an actual participant in the learning process. Although there have been many different results in the effects of interactive multimedia in a lesson, in some cases it may be of great value. It has even been questioned what defines interactive multimedia which a study by Domagk (2010) aims to clarify by defining interactivity in the context of multimedia as "reciprocal activity between a learner and a multimedia learning system, in which the [re]action of the learner is dependent upon the [re]action of the system and vice versa" (p. 1032). Understanding this definition and utilizing interactive multimedia with this in mind may help to deliver a clear message to the learner in a way that keeps motivation high and enables a greater level of importance in the lesson being taught. When presenting material in a multimedia instruction application there is sometimes a desire to make accessibility the first priority without giving much thought to a group who does not need the accessibility option. Kalyuga, Chandler and Sweller (2004) state "delivering text simultaneously in written and spoken form is common in multimedia presentations" (p. 567). Simultaneous and sequentially presented material can have two quite different effects on the learner, too much information presented at any given time can be a problem with the learners processing capacity. Delivering a multimedia lesson with the option of turning on or off methods of accessibility may be a necessary decision in multimedia instruction, user controls are necessary in many cases and also give the user a greater sense of control over when and what they need. Multimedia instruction may provide a great deal more motivation which traditional instructional methods do not provide. Wang (2010) theorizes that multimedia can provide a great deal more attractive and lively instruction which attracts interest and in some cases can encourage “student edification” (pg. 49). Current methods of teaching the Aeries system to teachers include face-to-face meetings with basic Microsoft Power Point instruction slides with pictures and some live demonstrations of normal activities performed. By providing the lesson using multimedia instructional methods a psychological obstacle is also removed. Wang states that “some students may be afraid of asking questions in real time due to psychological factors, such as embarrassment or shyness, leading to ineffective learning” (pg. 50). With all of the technologies available to create dynamic and interesting instructional multimedia pieces, the classroom is becoming quite a different place. Cohen (2005) discusses the challenge to old instructional methods and states that “the new paradigm stresses exploration, learning how to learn, problem solving and learning to collaborate” (pg. 62). She discusses the future where teachers no longer go into the classroom with the task of directing students but instead students must bring their skills and knowledge because the teacher doesn’t know it all, they have merely become a coach in the classroom and in the online classroom (Cohen). Multimedia instruction requires a great deal of thought and depth to produce functional work which will benefit the learner. Brown (2007) states that “a diverse range of production or resource handling skills are required in a relatively short time frame” (pg. 117) while discussing multimedia construction and the difficulties it presents. She also discusses how learners in these programs must not just be there in the lesson but also must be active learners who are self-aware of not only their learning style but also idea generators and analysts of the information being taught (Brown, 2007). Leading in an online environment is a difficult process of learning and changing behavior from methods of leading in a face-to-face situation. As the online leader it is necessary to know what is effective and what will work for leading a group of people and keeping motivation high. Practicing leadership online can lead to a better face-to-face experience; the review of literature relating to this has been very conclusive and seems to have a great deal of information. Creating a sense of community and belonging is important when working with instruction online and in a face-to-face environment. Accommodating everyone is a role the leader has to take on or else there is a threat of letting some learners slip through the gaps and lose out on the chance of attaining the full knowledge available. Accomplishing leadership skills changed throughout the years and the Internet created a great deal of change to gaining these skills. Multimedia Instruction has a significant place in instruction on the Internet and using the proper methods of delivery can make online instruction work or fail. Extending the knowledge of technology and how to use it is a necessary task in order for the technology to have its full reach. Making sure that educators are aware of the technology available and how to use it from the necessary tasks they must perform to teaching that technology to learners. Ensuring that instructional materials are absorbed at their maximum ability is up to the methods used in deploying it and what technologies are used. Cognitive Load Theory (CLT) is important to understand and implement as it allows for the technology to be used properly and benefit the learner. Development and evaluations were looked at and explained throughout this chapter. Participants were selected from both experienced Aeries users and novices to evaluate and review the tutorial prototype by answering questions presented in the tutorial analysis form and providing general comments. Going through the evaluations process using staff members who are both very knowledgeable about the product and what features need to be known by newly hired staff members and novice users who haven’t used Aeries enable the analysis to give the largest amount of information for improvements needing to be made. Instruments used to perform the analysis were Google Documents Form App which allowed for the testers to rate the effectiveness of the tutorial and give feedback as necessary. Email contact was made with the testers to make sure they knew deadlines for testing, requirements, and location of where to access the testing materials. The most important instrument in the development of the tutorial was the use of a content management system (CMS). Drupal was used along with many modules, such as a WYSIWYG (What You See Is What You Get) editor, to simplify editing of content to extend the capabilities of Drupal. In order to accomplish testing, development, and refinement the project was developed on a public web site which was accessible to the public including all necessary testers to enable them to easily visit and rate the progress as the project progressed. Testing materials through Google Docs was embedded on a web page in the tutorial for easy and public access to the testing materials with information and links to the product to be analyzed. By using an online rating and evaluation system data collection was extremely simple and easy to analyze. Results were simple to create and compare in the spreadsheet that was created automatically by the Google Documents Form App. Features needing to be refined after alpha testing were easy to determine and compare with the comments provided by the testers. After looking at the various aspects of the development of this project, a finely tuned and deeply analyzed tutorial for the Aeries student information system (SIS) can be created for the use of new staff members in the Chico Unified School District. With the finished product of the attendance portion of the tutorial analyzed the final portions of the tutorial will be able to be created for further expansion beyond the scope of this project. Participants were selected from staff members of Chico Unified School District who were well versed in Aeries and knew which features were used the most, a few participants were also selected from teaching staff of other school districts in California as the Aeries system is used throughout California, these staff members were not as knowledgeable about Aeries. Participants who fit the criteria were approached through email whether they would be willing to evaluate the tutorial for Aeries and participate throughout the analysis of the project. Participants were first asked to complete an online questionnaire sent through Google Documents Form application allowing them to evaluate the prototype of the Aeries tutorial (Appendix A). 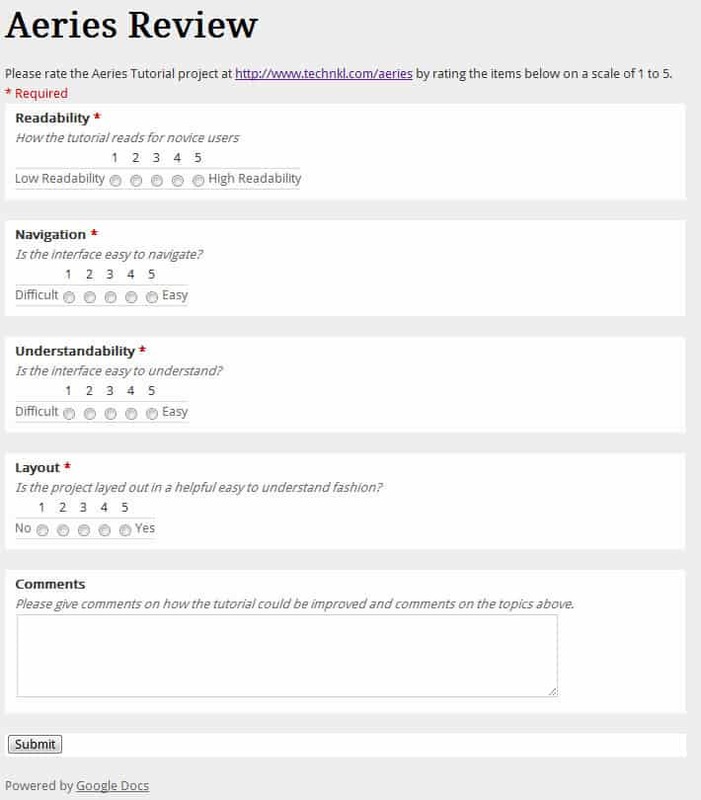 The questionnaire focused on how thoroughly the tutorial covered the most important topics of Aeries attendance along with readability, navigation, understandability, layout and community. The scope of this project was to determine if the tutorial met the objectives of converting novice Aeries users into at least an intermediate user who knows how to perform the required actions for their job. Educating the user on further features and abilities to enhance their knowledge of Aeries is a secondary objective which can be further explored in revisions of the tutorial outside the scope of this project. The projects was done using a content managements system called Drupal which was hosted on a public web site and allowed for all evaluation participants to freely access the content at any time. The module inside Drupal which was used is called the books module which allows for a simple tutorial flow and provides an easy to follow navigation of pages with related content. According to the documentation inside Drupal “the book module offers a means to organize a collection of related content pages, collectively known as a book. When viewed, this content automatically displays links to adjacent book pages, providing a simple navigation system for creating and reviewing structured content” (Drupal, 2011). After the questionnaire was created using Google Documents Form application, the form was embedded into a web page and a link was sent out to each tester via email. The testers were given five days to complete their survey in which time the survey results were collected from the Google Documents Form application and automatically placed into a Google Documents Spreadsheet document as is the normal process for Google to perform. Once this information was in Google Docs Spreadsheet it was organized to determine what should be done to improve the tutorial. By keeping the instruments portion online made the collection and organization of data extremely simple. All data from the participants of the alpha stage of development was already digitized therefore simplifying putting the data into an analyzable format. By simplifying this part of the data collection, necessary changes were simple to determine and modify in each version of the final tutorial. Data collected was provided in a rating system of 1 to 5 with 1 needing a great deal of work and 5 satisfying all requirements and needing only minor changes to be complete. Appendix B contains the scoring levels which were presented to the SMEs. Results (Appendix C) were looked at individually for the most part for changes that needed to be made in each revision of the tutorial. A comment portion in the review form was included for participants to write details about what improvements could be changed in order to allow the tutorial to reach all goals for instructing new staff members. A great deal of effort was put into making sure there was enough feedback to gain a good perspective on what the project lacked and what aspects were successful. Results were mainly positive regarding the flow of the tutorial and how easy it was to navigate as this resulted in the highest ratings from the testers at an average of 4.8. After the navigation was a three way tie between readability, understandability, and layout. These three topics are extremely important to be improved but the lowest scoring portion of the analysis was the community features of the product. Unfortunately there were not very many instructions on what community features are including in the tutorial but this was further looked at in Chapter Five. Further past the number ratings of each section is the comments section which provided a more human result of how the project accomplished its goal. Comments were very positive with some testers wishing they had the tutorial available for the times they used Aeries in the past. Some of the language was said to be a bit “techy.” With a few glitches in the overview video there were some complaints with audio not syncing properly with the video. Overall results from the testers was positive and helpful in determining where the tutorial was lacking and what aspects could be improved in the final revision. Developing an Instructional web site/multimedia project requires advance planning to ensure its success; planning ahead also reduces the amount of debugging and editing required throughout the development of the project. A successful instructional web site/multimedia project contains timely, well-researched content, combined with a navigation scheme that is easy to use. All too often, we see instructional Web sites with all kinds of cool graphics and animation, but they fail to meet the instructional objectives. The project involves creating an instructional web site using a content management system allowing for a simple Aeries training program to be created for teachers to utilize for initial training of the Content Management System (CMS) and for future reference. The initial version of this project will include a limited amount of training material for the teachers and may include the initial build-out of a discussion/comment system for the pages of each lesson. This project fulfills a need for training to be easily distributed to staff members while providing a source for future questions to be easily answered about the SIS which they will be using on a daily basis. There are many features which are currently not taught in the lessons in place and room for expanding the option of teachers to expand their use of Aeries. By providing a community within the web site teachers will be able to collaborate and perhaps discover new uses for the SIS which aren’t currently included in the lessons. The target audience of this web site included teachers of Chico Unified School District as they are required to use the Aeries SIS every day on their job. Other staff members and substitute teachers may also benefit from the web site as it can provide a quick and easy solution to learn the necessary features of the software. To quickly and efficiently teach new teaching staff members how to use the Aeries system and provide a resource which they can return to both to improve their skills and share newly found features with other staff members. Teachers will be able to apply the knowledge gained to take roll and track student grades in the Aeries student information system at the end of the Aeries grades and attendance tutorials. Teachers will be able to gather various reports about their students’ progress throughout the year using the Aeries student information system by the end of the Aeries tutorials. Teachers will be able to create a student seating chart using the Aeries browser interface at the end of the seating chart tutorial. Teachers will understand the basic layout of the Aeries student information system and how to perform basic tasks at the completion of all Aeries tutorials. Before this tutorial can be pursued, basic knowledge of computers is necessary including basic knowledge of how to navigate the Internet and basic understanding of manipulating items on the computer screen with the mouse and keyboard. Basic knowledge should be obtained first which will therefore allow for the learner to succeed in learning Aeries. A web site was the medium of choice for delivering the Aeries tutorial and community that surrounds the tutorial. To deliver the content a Content Management System (CMS) called Drupal was utilized, this has allowed for the project to be created using a simple interface that allows for easy manipulation in the future to any part of the tutorial. As content is added to the tutorial the CMS is able to adjust the navigation structure in real time for ease of use and easy additions in the future. While Drupal was utilized for the tutorial, more specific modules built into Drupal were used for each component which makes up the Aeries tutorial. The specific modules used are the book module which allows for the tutorial pages to operate much like a book where as the learner can turn pages and progress through the tutorial page by page or travel throughout the tutorial using the tiered structure. Another module used in the tutorial was the comments module which allows learners to leave comments for other learners on each page of the tutorial, this is to allow for a community to build where learners share their knowledge and experience with other learners. The last module used was the forum module which allows for a more complete community experience allowing users of the tutorial to actually converse with other users and share experience, knowledge, and different uses for the Aeries system. Each one of these sections of the tutorial allow for a complete experience of learning, sharing, and communicating creating a complete package to accomplish all learning needs and even expand beyond what the tutorial can provide. The design, delivery and evaluation for this project took place during the time frame of October 2010 to May 2011, a detailed breakdown of this time frame is seen below. The project began with the idea of an Aeries tutorial and the official proposal to begin working on this idea which led to immediate work on ideas of how to create the proposed project. While official approval for the project was still being waited upon the project timeline was begun which helped determine needs analysis to determine what would need to be done. After the needs were determined the frame of the Drupal web site was developed and how the site would be laid out was developed from the planning documents. After all content was placed into the Drupal system and modules configured properly the final product was analyzed and participants were notified of the testing procedures and timeline. After the testing period was completed by the content experts a review of the project was performed and necessary changes made. The tutorial was laid out similar to a web site with a title bar and breadcrumbs at the top of the browser window and with navigation along the left side of the screen. The navigation on the left will allow the learner to progress to any part of the program no matter where they currently are. There will be one difference that differs from a regular web site which would be a format which allows the learner to progress from page to page with continuous back/forward links at the bottom of each page much like a book. The evaluation of the Aeries tutorial was performed with a questionnaire which also allowed for open comments on the instructional product. Everything was done anonymously as to give the testers a chance to be open and as critical as needed without the possibility of tarnishing their personal image. This questionnaire can be viewed in Appendix A which allowed for the testers to accomplish this task at their own leisure and spend as much time on it as they needed. Participants to test the instructional product where chosen on their knowledge of the Aeries system both lack of knowledge and breadth of knowledge. Not only was the aesthetic quality of the Aeries tutorial rated but also the quality of the instructional material. Once all evaluations were received, modifications were done to the Aeries tutorial to attempt to meet as many of these recommendations as possible. Modifications of the product were done through the Drupal system much like that of a word processing program. Results of the analysis were placed into a spreadsheet and averages were created for each category. The comments section was looked at separate and used as a means for suggestions on how to improve the tutorial in its final revisions. Chapter five consists of a summary of the findings from the quiz and results of testing the Instructing Educators to use Aeries Using Multimedia Instruction tutorial project. After testing the production web-site of the Aeries tutorial a conclusion is drawn on how well the goal was met and what recommendations can be made on making a more complete and successful tutorial. After the information was analyzed a breakdown of what the project consists of and a final summary is provided as a recap on what the tutorial is and what it was created to accomplish. The final Aeries tutorial which was presented to Subject Matter Experts (SME) was overall extremely successful in delivering the intended learning objectives to the intended audience. The tutorial content was based on what is currently presented to new staff members of Chico Unified School District and therefor had the benefit of already meeting the basic needs of instructing new staff members. While the basic needs were met of the instructional objectives, there was still the matter of meeting the needs of allowing for a community to build around the presented instructional material and grow beyond the static content initially presented. These findings were concluded by providing the SME’s with a basic form which allowed for them to review the information in the tutorial and rate the most important factors. Along with the rating of these important factors the findings provided by the SME’s were available from the open comments section which allowed the SME’s to provide comments on any aspect of the tutorial and make suggestions of broad improvements. The largest improvement needed to complete the tutorial and make for a more complete learning experience is a learning checkpoint quiz after the completion of each lesson and in the scope of this tutorial at the completion of the Take Attendance lesson. A checkpoint quiz at the end of each lesson was initially intended in this project but due to time constraints was unable to be implement. Accomplishing the goal of each research questions proved to be a challenge but not a challenge that was impossible to reach. The first research question looked at how to best teach an adult group of educators who need to utilize the Aeries technology daily and give them the knowledge they need to perform their job and a place to refer back to in order to keep the knowledge available at all times. This goal also expanded into providing staff members a place to also expand that knowledge they gained from the tutorial by sharing and collaborating with other Aeries users to expand their knowledge beyond the tutorials capabilities. All aspects of this research question have been met and the ability to expand beyond the research question has been implemented and tested as being successful. Research question two focused on how Multimedia Instruction benefits the learners’ ability to retain learned information and increase the motivation during the learning process, this was partially reached through providing a multimedia rich environment by utilizing pictures and text but was completed more thoroughly with the Multimedia Instruction video providing both a visual walk-through of tasks to accomplish the learners goal and audio to make sure the steps are explained and understandable. Question three shows how online collaboration environments can lead to a positive learning experience and how that transfer helps the learner in many aspects of online learning which was accomplished with several community aspects of the project. In order to create a sense of user content and user participation in the learning experience, a comments section was made available at the end of each section both the expand and knowledge base of the tutorial and give future learners a sense of inclusion. In what way does enabling a community of learners to communicate within an instructional tutorial enhance the retention and expansion of knowledge? This research question was answered in the inclusion of a forum for asynchronous communication between current, former, and future participants of the tutorial. Enabling such a vast ability of communication, such as a forum, between all learners builds upon the knowledge presented in the tutorial and allows for endless amount of knowledge sharing in the future. This is a great expansion beyond what was initially presented in the tutorial and what learners are able to say in the comments section of the tutorial. The last research question looks at how to ensure everyone is included in the discussion and learning to propagate the message to all learners equally. This is easily accomplished by providing a minimum instruction based off of the tutorial and brief video at the end of each section. Even if the user is not comfortable participating in the community aspect of the tutorial they still come out with the basic knowledge necessary to use the Aeries system. Starting with the most important recommendations first would bring out the necessity of including some sort of quiz or at least a check-point section where users are presented with a summary of what they’ve gone over in each section of the tutorial. The video overview is helpful but does not go far enough in breaking down each section into its most basic part to increase the retention of each section. Another important recommendation for the tutorial is to better explain the social aspect included with the tutorial. By putting more instructions on how to register for the web site and include input for the tutorial pages, it would also help if there was an explanation of the forums and the purpose of them being there. Without a better explanation of how the social aspect of the tutorial can be utilized it is threatened to be an extremely powerful feature which remains un-utilized in any aspect of its capabilities. This paper and the information presented in it was developed over the course of 10 months from the beginning stages of compiling resources to the completion of a final deliverable project. Chapter One introduced the purpose of this paper and project giving a rationale for writing it. It also included the terms defined which have been used throughout the paper, what should be kept in mind as far as limitations and assumptions that must be kept in mind while reading this paper. Chapter Two included a review of related literature for topics relating to this project and research. Chapter Three develops the importance of the overall project and the methodology used to accomplish the project, it also includes a plan on how the final project was evaluated with testing from Subject Matter Experts and accomplishment of goals originally set. Chapter Four includes a description of the product including the purpose and intended use of the project. Chapter Five concludes the research and analysis of the project with a breakdown of findings, a final conclusion and recommendation for improvements to be made in future revisions out of the scope of the current project. Provided in the project also is a reference list, evaluation form, feedback, flowchart, and a few examples from the project pages, and IRB letter. Barnett, J. , & Coulson, M. (2010). Virtually real: A psychological perspective on massively multiplayer online games. Review of General Psychology, 14(2), 167-179. Bartlett, Y. , & Coulson, N. (2010). An investigation into the empowerment effects of using online support groups and how this affects health professional/patient communication. Patient Education and Counseling, Patient-Pat3991. Bell, M. (2010). Who knows what about technology?. MultiMedia & [email protected], 17(5), 27-30. Brown, C. (2007). Learning through multimedia construction—a complex strategy. Journal of Educational Multimedia and Hypermedia V. 16 No. 2 (2007) P. 93-124, 16 no. 2(2), 93-124. Cohen, K. (2005). Multimedia and collaborative learning. Visual Resources Association Bulletin V. 32 No. 2 (Fall 2005) P. 62-3, 32 no. 2(2), 62-63.
de Leng, B. , Dolmans, D. , Donkers, H. , Muijtjens, A. , & van der Vleuten, C. (2010). Instruments to explore blended learning: Modifying a method to analyse online communication for the analysis of face-to-face communication. Computers & Education, 644-6510360-13. Domagk, S. , Schwartz, R. , & Plass, J. (2010). Interactivity in multimedia learning: An integrated model. Computers in Human Behavior, 26(5), 1024-1033. Eagle Software. (November 1, 2010). Press Releases from Eagle Software. In Aeries Student Information System. Retrieved January 22, 2011, from http://www.aeries.com/news.asp. Eagle Software. (). Overview. In Aeries Student Information System. Retrieved January 23, 2011, from http://www.aeries.com/aeries_overview.asp. Herron, D. (2006). Students and graduates learn library educational content from interactive multimedia tutorials. Evidence Based Library and Information Practice V. 1 No. 4 (2006) P. 64-6, 1 no. 4(4), 64-66. Kalyuga, S. , Chandler, P. , , . , & Sweller, J. (2004). When redundant on-screen text in multimedia technical instruction can interfere with learning. Human Factors: The Journal of the Human Factors and Ergonomics Society, 46, 567-581. Kolb, D. , Prussia, G. , & Francoeur, J. (2009). Connectivity and leadership: The influence of online activity on closeness and effectiveness. Journal of Leadership & Organizational Studies, 15(4), 342- 3521548-05. Livingston, K. , & Condie, R. (2006). The impact of an online learning program on teaching and learning strategies. Theory into Practice, 45(2), 150-158. McKee, H. (2002). ''your views showed true ignorance!!! '': (mis)communication in an online interracial discussion forum. Computers and Composition, 19(4), 411-434. McLean, C. (2007). Building teen communities online: Listen, listen and listen. Young Adult Library Services V. 5 No. 4 (Summer 2007) P. 21-6, 5 no. 4(4), 21-26. McLoughlin, C. , & Luca, J. (2002). A learner-centred approach to developing team skills through web- based learning and assessment. British Journal of Educational Technology, 33(5), 571-582. Miller, M. , & Cryss Brunner, C. (2008). Social impact in technologically-mediated communication: An examination of online influence. Computers in Human Behavior, 24(6), 2972-2991. Mitchem, K. , Koury, K. , Fitzgerald, G. , Hollingsead, C. , Miller, K. , et al. (2009). The effects of instructional implementation on learning with interactive multimedia case-based instruction. Teacher Education and Special Education V. 32 No. 4 (November 2009) P. 297-318, 32 no. 4(4), 297-318. Mo, P. , & Coulson, N. (2010). Empowering processes in online support groups among people living with hiv/aids: A comparative analysis of 'lurkers' and 'posters'. Computers in Human Behavior, 26(5), 1183-11930747-5. Ngoma, S. (2010). Improving student learning: A strategic planning framework for an integrated student information system in charlotte-mecklenburg schools. Online Submission, . Pastore, R. (2010). The effects of diagrams and time-compressed instruction on learning and learners' perceptions of cognitive load. Educational Technology Research & Development, 58(5), 485-505. Pickering, K. (2009). Student ethos in the online technical communication classroom: Diverse voices. Technical Communication Quarterly, 18(2), 166-1871057-22. Seo, K. , Templeton, R. , & Pellegrino, D. (2008). Creating a ripple effect: Incorporating multimedia-assisted project-based learning in teacher education. Theory into Practice V. 47 No. 3 (Summer 2008) P. 259-65, 47 no. 3(3), 259-265. Sweller, J., & Chandler, P. (1994). Why some material is difficult to learn. Cognition and Instruction, 12(3), 185-233. Tabbers, H. , & Koeijer, B. (2010). Learner control in animated multimedia instructions. Instructional Science V. 38 No. 5 (September 2010) P. 441-53, 38 no. 5(5), 441-453. Tempelman-Kluit, N. (2006). Multimedia learning theories and online instruction. College & Research Libraries V. 67 No. 4 (July 2006) P. 364-9, 67 no. 4(4), 364-369. Thompson, N. , & McGill, T. (2008). Multimedia and cognition: Examining the effect of applying cognitive principles to the design of instructional materials. Journal of Educational Computing Research V. 39 No. 2 (2008) P. 143-59, 39 no. 2(2), 143-159. Tsang, A. , & Zhou, N. (2005). Newsgroup participants as opinion leaders and seekers in online and offline communication environments. Journal of Business Research, 58(9), 1186-1193. Wang, T. (2010). Educational benefits of multimedia skills training. TechTrends V. 54 No. 1 (January 2010) P. 47-57, 54 no. 1(1), 47-57.